Let’s say that we receive flat file from our client that we need to load into our SQL Server table. Beside loading the data from flat file into our destination table we also want to track how many records loaded from flat file. To keep track of Records Inserted we can create Audit table. 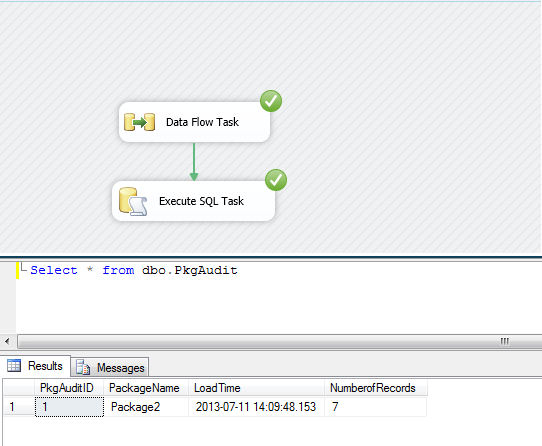 When we execute our package the rows are inserted into destination by passing Row Count Transformation. All the count is saved in the variable. Our next goal is to save this information to our Audit Table for record. Let's run our package and see if information is recorded in our Audit table. As you can see below 7 records were loading from source file to our destination. The same Audit table can be enhanced by adding more columns such as records update, record deleted , records rejected and save all these stats while execution of package in different variables and at the end insert into Audit Table.